FORMERLY or FORMALLY: which is which? Top spelling tips to remember the difference. FORMERLY or FORMALLY – they sound the same but their meanings are very different. So, what do these words mean – and how do you decide which spelling you need? It’s easy. These simple spelling tips will help you decide whether you need the word FORMERLY or FORMALLY. FORMERLY means something that happened before, or in the past. The clue is in the root of the word: FORMER. FORMALLY means in accordance with etiquette or convention. It’s easy to remember when you know it starts with FORMAL. 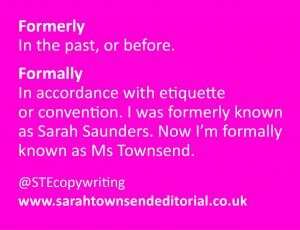 I hope this helps you to remember the difference between FORMERLY and FORMALLY. Want more spelling and writing tips?